Musings, ramblings, book reviews, and everything between the lines! 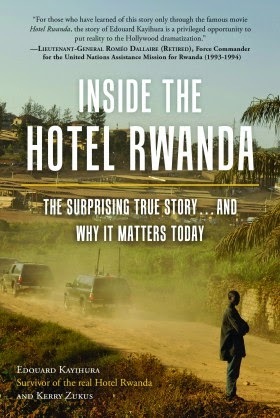 For most people who know about the Rwandan genocide in 1994, they first learned about it by the Academy Award nominated 2004 film Hotel Rwanda staring Don Cheadle—who was nominated for Best Actor—portrays Paul Rusesabagina, the manager of the Hotel Milles Collines who single handily saved over 1500 people who sought refuge inside the luxury hotel. He was named the Oskar Schindler of Africa and dubbed a hero by the world. But as the cliché goes, you can’t believe everything you see, especially a Hollywood film. Edouard Kayihura escaped the Hutu extremists and made his way to the hotel. What he saw and experienced was the complete opposite from the film with Rusesabagina threatening to kick out anyone who didn’t pay and drinking with the men responsible for orchestrating the genocide. The hundreds of people, both Hutu and Tutsis alike, have to survive the killings and terror from both the outside and within. When I began reading Inside the Hotel Rwanda, I wasn’t able to put it down. The harrowing stories of survival from within the hotel were heart wrenching as survivors struggled day after day for food and drinking the chlorine pool water while Rusesabagina drank the day away with the money he extorted from the people themselves. It was confusing at times while I read and sometimes, I had to go back and re-read the passages. That being said, it not only made me furious, but it was also deeply moving to read about the real heroes of the story, from the UN peacekeepers keeping guard, to the ordinary individuals who risked their lives in bringing people to the hotel, and the camaraderie built regardless of ethnicity. Right after I read Shake Hands with the Devil, written by Romeo Dallaire, commander of the UN mission during the genocide in Rwanda, (A book I highly recommend) I saw the film and was able to point out the inaccuracies of the events and misrepresentation of characters. I do owe some credit to the film in first learning about Rwanda, but still. Inside the Hotel Rwanda is a riveting expose of a so-called hero that Hollywood created and an examination of how it came to be. It is also a deeply moving tribute for the million or so Rwandans killed, the survivors who endured the horror of the genocide, and the brave individuals who risked their lives for the very sake of humanity and who are finally getting their own long-overdue recognition. A film I recommend watching, and a great counter-piece to "Hotel Rwanda" is "Shake Hands with the Devil" a Canadian film from 2007, based on the book. It stars Roy Dupuis as Gen. Dallaire and it's a powerful and soul-stirring performance. Not to mention, filmed entirely in Rwanda and in the actual locations where the events took place. Watch the trailer. I always prefer to read review before booking any hotel. It gives you idea which one is the best for you and I am happy that I found Tazoff.com as hotel booking website just because f my this habit. A book junkie since grade school, there is nothing better than to curl up with good book. You can usually find me at the library, thrift stores, and local bookstores searching for a good read. I usually review YA books and contemporary fiction as well. Ruth has read 4 books toward her goal of 70 books. Ruth has read 33 books toward her goal of 50 books.